A variety of tissue fillers, all temporary, are used at the practice. Hyaluronic acid is a crystal-clear gel form, which is a substance that occurs naturally in the body. Hyaluronic acid has the ability to hold water, hydrating and giving volume to the skin. A clear gel is injected into the skin just beneath the wrinkle, plumping it out. A local anaesthetic can be used, depending on the area. Many people find they need no anaesthetic. The beauty of this procedure is that most patients can return to work immediately after the treatment. Slight bruising may occur, but this should disappear after a week. Numbness and a little redness may also occur but can easily be covered with make-up. 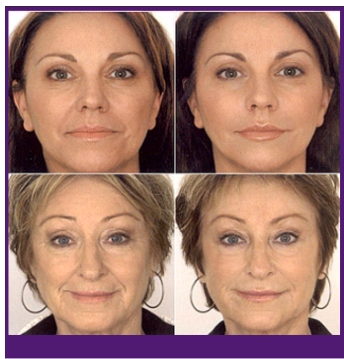 Where can Tissue fillers be used? to fill in acne scars, deep cuts, chicken pox scars etc. Results are seen instantly, but the full effect can take up to one month to show. What is the difference between BOTOX and Tissue Fillers? BOTOX paralyses the muscle, releasing the wrinkles and stopping them from forming in the future, whilst Tissue fillers plump up and fill the existing wrinkles.